No smuggler has as big of a reputation for being a bold scoundrel as Han Solo does. It might be because he owes Jabba the Hutt a lot of money (which is never a good idea), or it maybe because he shot at Darth Vader's ship (which is an even worse idea). One thing that's for certain, though, is no one in the whole Star Wars galaxy can pull off interstellar swagger like Han can. Luckily, we're not in the Star Wars galaxy, so you can suit up in this Deluxe Han Solo Costume, and you'll look just like the scruffy looking nerf herder from the classic Star Wars movies! But be careful when wearing this outfit, since looking like a dashing space pirate is (much like traveling through hyperspace) not like dusting crops. You'll need to keep a cool head, even when confronted by bounty hunters, Imperial patrols, and constant ship breakdowns. If you're not ready to shoot first and ask questions later, or take your reward money and run before a hopeless battle, you're going to have a tough time being Captain Solo. But don't worry, everyone knows that Han's not a total space-jerk, he always does the right thing (eventually). 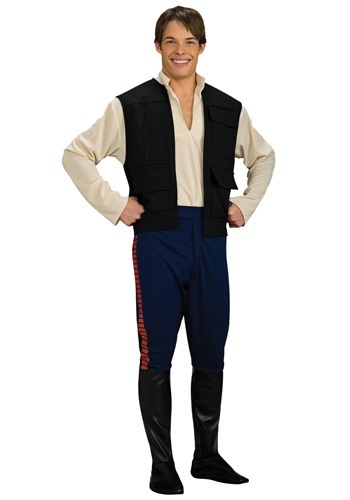 All you have to do is don this licensed Star Wars costume, and you'll be dressed like the dashing smuggler in A New Hope. Then, just act sarcastically and pretend you're only doing anything for the money, and you'll be on your way to pulling off that classic Han Solo charm! Oh, and get a good blaster to carry at your side, too. You'll need it.